The thing about parks and monuments is that they should always leave a lasting impression. More so to foreigners who might be interested in knowing the history or origins of such beautiful sites. In the city of Oklahoma, there is one such park located at the south end of the Bricktown Canal. This monument is open for the public all through the year. Here exists the grand sculpture of the land run that you will find mind-blowing. If you are new to OKC, visiting or recently relocated, then the Centennial Land run monument is a recommended site that you must see for yourself to believe in the beauty of history. This is a family park that has gone to depths to provide the actual feel of the historical days brought to life. As history has it, On April 22, 1889, a day of the First Land Run saw an estimated 50,000 people rush to claim the unassigned lands of Oklahoma to claim their territories of vast free lands. There was total chaos after the cannon shot at noon. The mad dash saw people crushed by falling wagons as fights for the best lands ensued. All this is depicted by the great set of statues that are intricately detailed and leaves no emotion to the imagination. For instance, you will marvel at a particular statue that has one man falling off his horse heading for an inevitable face plant as his horse falters. The walking trail is blessed with many decorated larger than life bronze statues that are one and a half times the size of a normal person. The sheer size of the statues captures the livelihood of this era as men and women raced to their livelihoods in the famous Oklahoma City Centennial Land Run Monument. 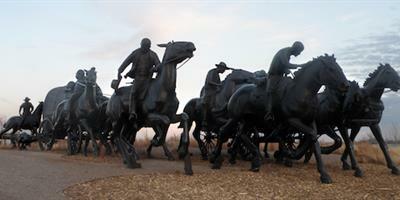 Being a city park, the Oklahoma Centennial Land Run Monument is designed to be accessible by everybody. It has easy access for people in wheelchairs to gain entrance to the trail. The park has ample parking grounds where visitors can start their historical walk. There are beautiful restaurants along the river canal where visitors often take a break to eat or drink. The monumental park is also considered children friendly. However, most people are negligent of the clear signs that discourage foreigners and visitors of the park to stop their children from climbing on the statues. In order to protect its natural beauty and retain its allure of a historical walk, everyone visiting the Oklahoma Centennial Land Run Monument should safeguard this part of important history. Besides the marvels of the historical monumental walk, both local and foreign visitors can engage in other numerous activities. The first of the many options is the taking of beautiful photos with the larger than life statues. The park is also surrounded by beautiful hotels where you can get a spa at the end of a very long historical walk. This monumental park is a permanent archive of the brave men and women who became the pioneers of the great City of Oklahoma by forever staking their claim in history for the first ever Oklahoma Centennial Land Run. If you're visiting Oklahoma City for pleasure be sure to check out other attractions like the Oklahoma History Museum. You can learn more here.